At Air Duct Cleaning Simi Valley we are proud to offer our customers the best in air vent cleaning and sanitation services which are geared towards keeping the air in your home or office free from contaminants. Whether you have mold in your air vents¸ they are clogged by dirt and debris, or you need to have your dryer vented, our highly trained and skilled technicians are here to assist you with your vents, dryers and HVAC systems. So, give us a call or browse through our website for more details on the services that we have to offer. Your ventilation ducts are great for circulating clean air through your home or office while maintaining ideal temperatures in your indoor spaces. They do, however, take on dirt, dust and debris through their operation which could not only affect your system’s performance, but can also lead to higher levels of contaminants in the air. For this reason, they should be cleaned and decontaminated regularly with the assistance of an experienced professional. Speak to us for more details on having your ducts, vents and HVAC systems cleaned. Let us assist you with having your indoor air quality tested to determine whether or not your ducts need cleaning. Since a bogged-down air duct almost certainly leads to lower quality air being circulated throughout your indoor spaces, testing the quality of your air is a great start to having your ventilation system cleaned. Call us now for assistance with this matter. The presence of mold in your air vents could spell disaster for your indoor air quality, and may even lead to allergic reactions such as breathing disorders or skin ailments. Unfortunately, once mold spores take root in your vents, it can be almost impossible to remove with simple cleaning methods. Fortunately, our team has the skill and know-how to eradicate mold from your vents, making it easier for you to maintain the quality of air in your home. Keeping your drier ducts clean will help ensure that they continue to operate to your expectations, and also ensures that your dryers don’t become a fire hazard. The fine particles of lint that collect in your dryers are extremely flammable, when this is combined with the heat given off by your dryer, it is easy to see why a dirty dryer vent could be dangerous. So, call us today if you need assistance with venting a dryer in your home or place of work. 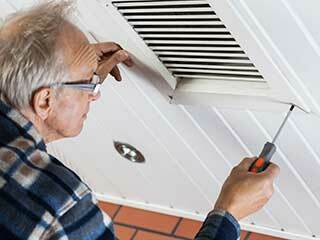 So, call Air Duct Cleaning Simi Valley for more information on our vent cleaning and sanitation services. Our consultants are here to help, offer information and advice. So, let us know how we can assist you.